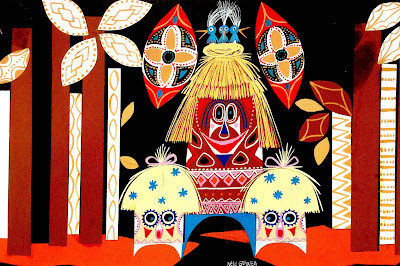 The Art And Flair Of Mary Blair is a treasure. This book is so filled with whimsical, stark, gorgeous pieces of Disney history that it rarely leaves our coffee table. It is such a pleasure to randomly flip to a page and be inspired. Such is the case today. Toward the end of her main stint with the Disney company, Walt's utilization of her talent switched from film to attractions, most notably It's A Small World. The giant warehouse that would be used at the 1964 Worlds Fair where the attraction debuted would be a fitting location for the harsh black backgrounds often used by Blair. This color theory trick of vibrant colors against a dark single plane of black and dark grey was prominent in her work since the early 1940's. In film these images are just used as a jumping off point for background artists and animators, but her Blair's work is carried through to completion. It's A Small World is a sincere living tribute to her magical work. The fact that this attraction, in all of its intensely stylized grandeur, still exists in the parks is amazing. It is absolutely one of the most realized concepts from start to finish, with each creative mind melding ideas until the perfect medium was found. It boggles my mind that the company (seemingly?) doesn't commission and support artists ala carte. I suppose Kevin and Jody are the closest thing we're going to get, but I'm still waiting for that background artist with the right amount of abstract magic to blow me away. Who is going to be our generations Mary Blair?? 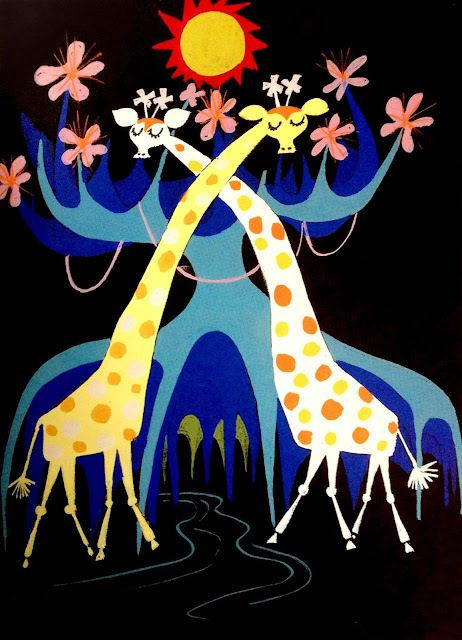 Mary Blair is amazing. 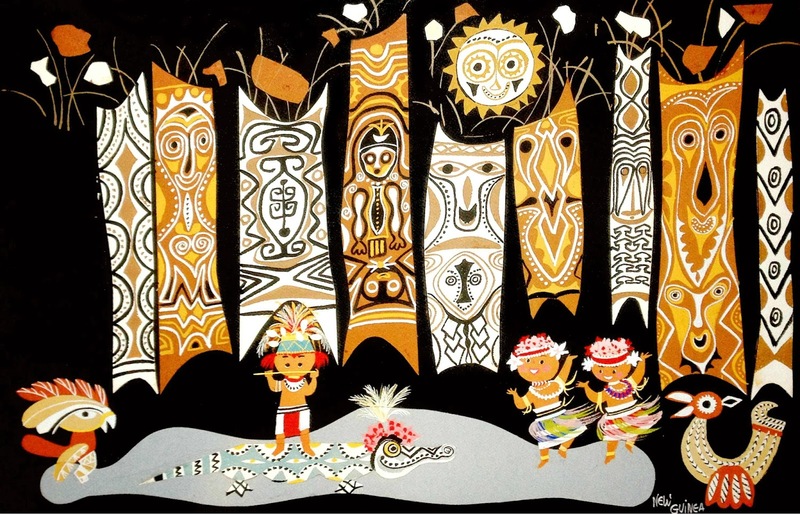 Her mural in the Contemporary is one of the things that made me fall in love with the WDW resort and makes it feel so planted in a specific time. I will now be spending a portion of tonight poring through this book again, thanks for posting these. I got to the part about the Disnelyland Tomorrowland mural and got sad. I love Mary Blair's work, it's so beautiful and colorful... It's the main reason I will ride It's A Small World multiple times.